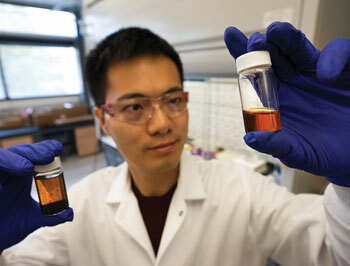 In the Energy Innovation Center’s Carbon Engineering Lab, chemical engineering post-doctoral researcher Shuai Tan holds two vials containing coal extraction solvent and resulting coal tars, which will be used for carbon fiber fabrication. The School of Energy Resources’ Carbon Engineering Initiative seeks to create new products from coal. Imagine driving in a car made in part of carbon fiber created using coal products. That same car is driving on asphalt made more resilient to winter conditions by incorporating coal products. And beside the road grow crops planted in soil made richer and more water efficient thanks to coal product soil amendments. All of these future possibilities are being explored by faculty and researchers participating in the Carbon Engineering Initiative that is being spearheaded by the School of Energy Resources (SER). This programmatic partnership with the College of Engineering and Applied Science brings together many research groups. Nearly three years ago, the Legislature appropriated funds to establish research in carbon engineering, whereby the focus of activity is to turn Wyoming coal into higher-value coal products. These funds are leveraged with additional money provided by the SER annual budget. “The faculty have generated results that have led to four patents awarded and 23 applied for, including a patent for a process that we’re calling a coal refinery,” Northam says. The coal refinery is a unique and novel thermochemical process for deliberately decomposing coal into usable intermediate products. Thinking big may mean working with venture capitalists and private equity and already includes partnering with existing companies. “We’ve spent a tremendous amount of time talking to companies that are interested in pieces of the technology to complement things they have invented,” Northam says. This includes more efficient ways to use coal for electricity generation. 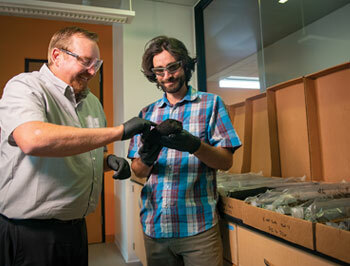 SER Director of Research Scott Quillinan and Assistant Research Scientist Thomas Moore examine coal core samples. Formed in 2009 as part of the School of Energy Resources (SER), the center was originally called the Carbon Management Institute and focused on carbon capture, utilization and storage. Last year, the center’s mission broadened to look at rare earth elements research, becoming the Center for Economic Geology Research. The group is made up of nine researchers—many UW graduates—that include eight geoscientists and one reservoir engineer. They started out studying the Rock Springs Uplift as a potential storage site for carbon dioxide (CO2). That work led to a textbook on geological reservoir characterization, Geological CO2 Storage Characterization, which the U.S. Department of Energy (DOE) used to inform its best practices manuals for reservoir characterization. The CarbonSAFE (Carbon Storage, Assurance and Facility Enterprise) program is an initiative funded by the DOE to address key research gaps in the path toward the deployment of carbon capture and storage technologies, including the development of commercial-scale geologic storage sites for CO2 from industrial sources. Researchers are working with the Dry Fork Station near Gillette—the newest, most efficient coal-fired power plant in the nation. The plant is the host site for the Wyoming Integrated Test Center. In addition, the Center for Economic Geology Research is looking at rare earth elements and is in the process of doing an inventory to see what’s out there.